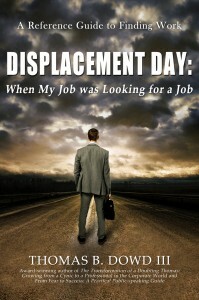 Thomas Dowd is the author of his book, Displacement Day. It’s about trying to recover from losing a job and going out job hunting. One of the things that I thought was very interesting was the way he would go about job seeking and how he recommends others do it as well. It’s the difference between networking and job searching. I really liked the fact that he brought up how to go about finding a job. Recently, I’ve been approached by a couple people who tell me that they’re looking for jobs. When they come up to me and they ask, “Hey, I’m looking for a job. I don’t have a job. Is there anything that I can do?” Desperately I want to try to help them in some capacity, but it’s tough to think of a way to do that. Sometimes I think of people that I might know to put them in touch with. What Tom brought up in the interview was that instead of being a job seeker, instead of asking people for jobs all the time. Which actually can be kind of a weird feeling, because the person you’re asking, it feels a little uncomfortable because they want to help, but they can feel like they are in control of your destiny… it’s a lot of pressure and makes it a more uncomfortable conversation, I think. Where, if you look at it as you are networking with someone who could potentially give you a job, and not so much like, “hey I need a job, give me a job.” Instead, going in there and asking asking them questions about their business, what is it that they well, how do people get that job, how do they excel in that industry. By asking those questions it’s more of a relationship where you have two people engaging and discussing together. It’s more comfortable for the other people involved. It’s really a great way to think about job seeking and looking for jobs. In the interview I mentioned that I went around the country, and check out Craigslist and just blast my resume out everywhere. Say, “Hey, I need a job! I need a job! I need a job!” I’m telling everyone, and it didn’t work for me. If I had gone about it differently and I had looked for ways to network with those people I think I would have had better results. If you are looking for a job, follow Tom’s advice. Now, go out there and find your success! Tom was a communications major at the University of Delaware. He graduated on a Friday and started work at a Finance company on a Monday. Worked there in several positions for over 23 years. When his company was taken over and went from a 28,000 person organization to a 300,000 person organization, he had to make a mental adjustment: decide if he was going to be swallowed up in the 300,000 person organization or did he want to make a difference. 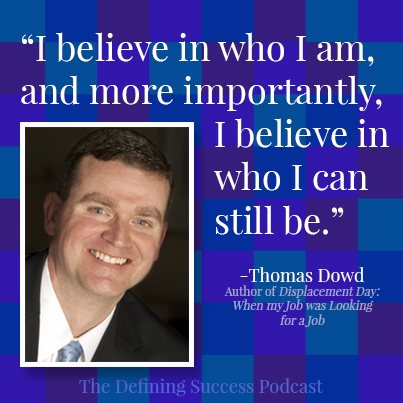 He joined Host Masters, a worldwide organization that helps to improve communication skills and leadership skills, it was that that boosted Tom’s confidence through the roof. It allowed him to do things within his own professional state, and within the organization to make a difference in the organization. He wrote a couple books while he was at that job. One was on his own transformation of becoming self aware and the other on public speaking. In Toast Masters, he competed in these speech competitions. Twice he got as far as one speech away from the world semi-finals. 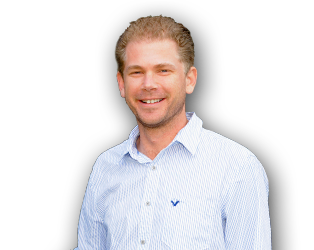 He met many people who helped him in his journey of communication, confidence and leadership. He gained mentors. 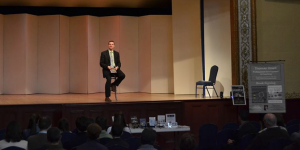 One of whom inspired him to write about leadership, success, and how to be a better speaker. To clarify what he means by “Being Yourself.” He was learning to build trust and build relationships. Tom compares his work-self to his home-self. There’s the Tom who is sitting at the dinner table having a conversation with his family, laughing, joking, casual. It’s not about communication or confidence, it’s just being Tom. And then he goes to work, has a tie choking him around the neck, a white collar, get the job done, force the hand of the people around him, give them critical feedback whether they want it or not, who never missed his goals, never missed hitting his numbers. He got lots of criticism. There were a few people who gained his trust. One of them talked to him and asked him about his relationships with the other people at the company. It helped him realize things he needed to change. He had a reputation as an uptight guy who gets the job done, but people were concerned about his leadership abilities. Once a month he would pick up the phone and talk to somebody he didn’t know, and who were a couple levels above him in the organization. To push his comfort zone and to reinventing himself. He would tell them about what he’s been doing at the organization and what they’ve been doing. How they could maybe help each other. He became a better listener, a better business partner, became more successful because he stopped trying to impress people and just worried about the job. The people became more important to him. When he found out his company was downsizing, he said that phone call was almost calming. He has such confidence in the network he built, in the skills he had, in his vulnerability to learn from his mistakes and develop who he wanted to be, he says he saw the whole world ahead of him and said, “Okay.” He wasn’t worried. 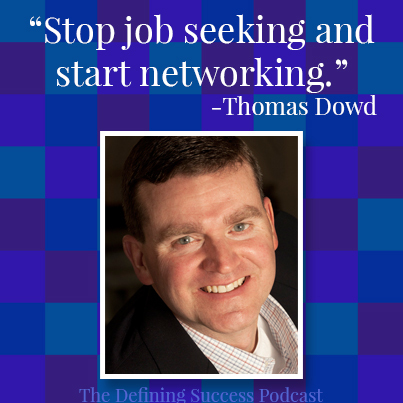 Tom stopped asking for a job and started working to build his relationships with people in his network. He had to reinvent himself to them so they would know what he was looking for. Also, he says one of the biggest things he learned was don’t make assumptions. Because he assumed that people in his network, certain people, would support him – drop everything they’re doing to give Tom advice, give him a direction, a path. That wasn’t always the case He realized that they were too close to him. They knew exactly what he wanted and what he didn’t want. It was the secondary network, people who knew people, who had new conversations with Tom about what are you looking for? what do you want? and that led to the first chapter of his book. By talking to his secondary network Tom realized that maybe he didn’t need to go back into the financial industry. Another assumption. He had the speaking stuff, this coaching, this training world that maybe he could turn into a job. If you’re networking, instead of job seeking, there is no expectation. It takes the pressure away from the situation so they won’t shy away. Tom says to have an elevator speech, whether you’re employed or not. Think about what do you want people to know about you. What is your greatest accomplishment. Have a 2 min, 5 min, 10 min version of who you are that you can share. Tom says, that’s when you see the spiderweb of network. That’s where you move past sympathy and into action. He says, I had a little credibility issue as I was trying to coach and train people on how to write resumes and network while I was unemployed. I continued to do that while I was job seeking. I talked to people that had been looking for jobs for over two years. I found a lot of people who would not apply for a job because they met a few of the requirements, but they did not quite meet everything within the job description. He says the hiring manager put down the absolute perfect candidate, probably no one is going meet everything on that job description. He also recommends that have to differentiate yourself, all resume’s look the same. Make your story come alive. Your resume should read like a book. It is the introductory chapter, make people want to read the rest of the book. People always get frozen in these situations. Always have a plan. Wake up like you have a job. Have a plan of attack for the day. Send emails, make phone calls, schedule and go to meetings. What is your marketing plan? What companies are you going to target? Until someone offers you a job and you’re unpacking your boxes at that organization you need to continue job searching. When “I got my full time job offer, I was ecstatic, I told my wife, I came back upstairs to the laptop and I continued my job search until I had the official contract signed.” It wasn’t a lack of confidence that he’d get the job, it was how many times did things fall through before becoming official. Anyone out there that considers themselves a failure. I would tell them to go back and revisit themselves. You shouldn’t be striving for perfection, you should be striving for excellence and really strive to make yourself a better person. This entry was posted in Uncategorized and tagged Be Yourself, Defining Success Podcast, Develop Relationships, Displacement Day, Displacement Day: When My Job was Looking for a Job, Finding Work, How to Network, Job Searching, Job Seeking, Leader, Leadership, Leadership Skills, Network, Networking, Networking Skills, Public Speaker, Public Speaking, Secondary Network, Speaking, Thomas Dowd, Tom Dowd, Transformation Tom, Zeb Welborn on May 28, 2014 by Admin.